You know, people running for president accept donations from all sorts of people who don’t always agree with them on all issues. 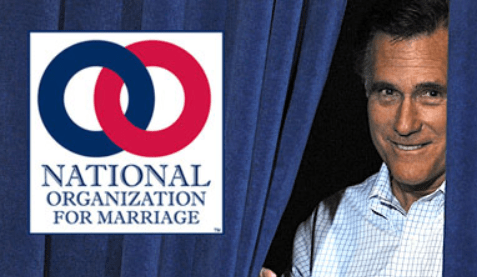 The fact of the matter is, Governor Romney has signed our pledge where he will defend the Defense of Marriage Act, where he will support an amendment to protect traditional marriage nationwide. He has signed that pledge and we fully expect that he will honor his pledge in that regard.” – John Eastman, chairman of NOM. Really going out on a ledge there with that prediction there Eastman aren’t you? I mean how could you ever predict that considering NOM has major Mormon backing and Mittens was busted for donating to $10,000 to NOM in the past tofight to pass California’s Proposition 8. OMFG Hold My Broom! : Disney Channel Confirms Hocus Pocus Remake Those BASTARDS! There is more to this than just these idiots, this measure will never get out of Congress to go to the states for voting ratification. It is such a stupid waste of time and money.